This is the last of my sales posts, now (though I might get around to videoing my fashion purchases if I can stop watching The Good Wife for long enough) and at long last we have reached the pleasing subject of makeup. There are plenty of discounts out there, if you search – leftover limited edition stock that needs to be cleared, weird eyeshadow shades that nobody has bought. But today’s post focuses on the everyday essentials that are available all year round – it’s just that at the moment, they happen to be cheaper. I have photographed five of my cosmetic essentials – all have around 20% off with the links below, apart from the Teint Touche Eclat foundation – but I will also point you in the direction of many more exquisite pieces that are worth grabbing whilst the prices are slashed. 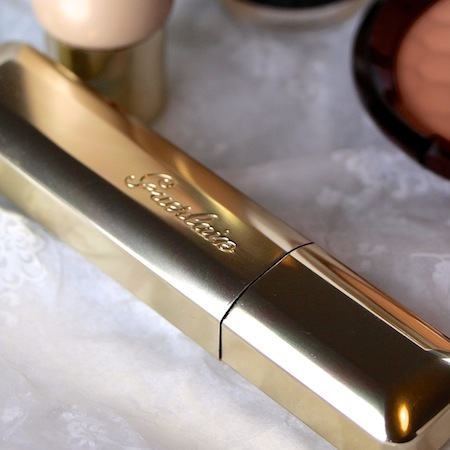 Moving on in a non-precise clockwise motion we arrive at the concealer-in-a-tube by Clarins. This Instant Concealer is very good indeed – doesn’t crease, easy to apply, gives a very soft, dewy finish. The only moan I have is that the nozzle of the tube is a little wide, so you do “lose” some product if you’re not careful, but I store upside down now that I’ve wised up to it! Usual price: £20. Sales price: £16. I use shade 1, or shade 1 and 2 mixed together in the summer. Find it here. Other great deals at Escentual.com include Guerlain’s “Crazy Paris” limited edition eye palette, which is down from £54 to £27 here and the gorgeous body shimmer that’s fragranced with La Petite Robe Noire and will look insanely good in modern bathrooms and boudoirs! The shimmer is pink and very fine and the scent, in case you’re not familiar, is like a floral black cherry. It is £25 instead of £51 here. Escentual have another of my favourite mascaras on sale, the Be Long from Clarins. I reviewed this here. Again, easy to apply and stays put for ages, but this one is lengthening rather than fattening. It should be £21 but in the sale it is £16.79. Find it here. 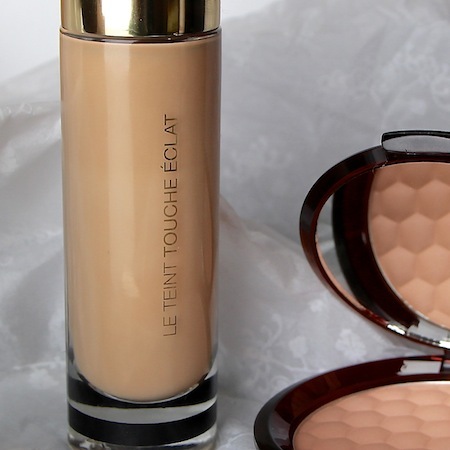 Now to foundation: FeelUnique.com have the wonderful Teint Touche Eclat base discounted by up to 50%, depending on which shade you are. Most shades have a 15% discount, but if you’re the very darkest, B90 then you can grab a bottle for £14.50 rather than the usual £29. I wear a mixture depending on the time of year and whether I have my glasses on (always grabbing the wrong bottle) but in general, the 30s and 40s suit me, whether the “B” version (beige) or the “BD” (golden beige). This is a very fluid base that feels light but has good coverage and leaves the skin looking very radiant without the need for shimmer. I’d probably recommend going to a counter to test your shade, but if you know it already then this is the place to stock up! Find it here. 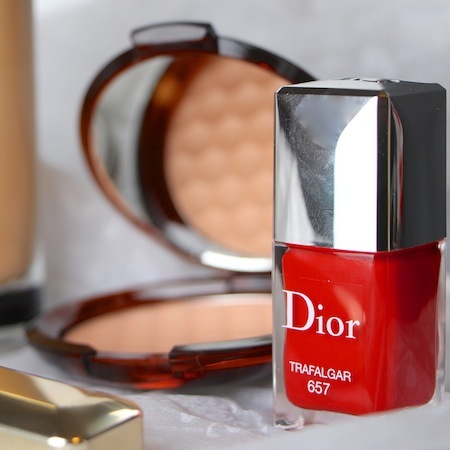 Nails: for me, the ultimate polish comes from Dior. Wide brush, brilliant colours, chic packaging – each bottle feels like a proper little treat. They are easy to apply and I find that they last very well, though please remember to use a base coat under the more reddish shades – I had bad staining with Riviera a couple of years ago! My favourite shades? Trafalgar, Riviera, Incognito and Delice from the summer collection. Find them reduced to £14.39 here. Lastly, one of my most-used items, the Body Shop bronzer. You’re probably sick of hearing about it by now, but seriously: it’s great. Very pale, very subtle, no shimmer; absolutely foolproof. I use shade 2 or 3, depending on how I feel and the effect that I want – Body Shop always have discount codes running, so you’ll probably be able to bag this £13 compact at a fraction of the price. Have a look here and check their homepage for codes! 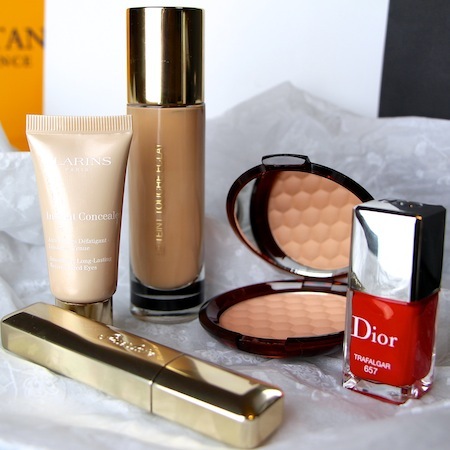 This post is just a guide with a few of my favourite products but the discounts are mostly over the entire site or brand and so if you have a favourite Dior foundation or Lancome mascara, they will be reduced to. Just click the links and browse – FeelUnique has all of the big guys such as YSL, Dior, Lancome, Guerlain and so on, but Escentual.com has Dior and Guerlain and also has the bigger discount running.